Here’s two projects for knitted animals. I love making toys and the knitted wild animals book by Sarah Keen is my favourite so far. The patterns are easy and the end result is lovely. 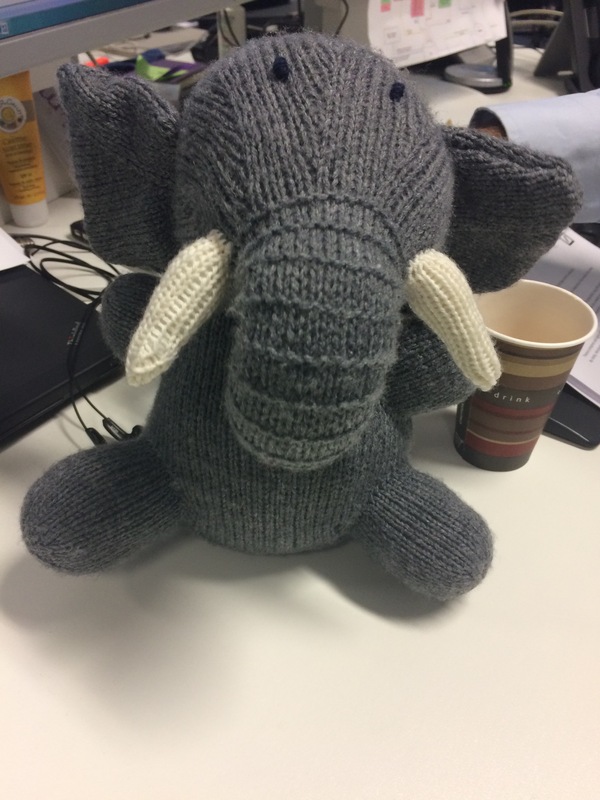 The first project is an Elephant for my friend Beatrice’s first baby. The elephant pattern is from this book. I started knitting it in May on a long flight from London to Antigua. We’d been upgraded to business class so I had a lovely flat bed, footstool, blanket, dodgy film and free champagne and an 8 hour flight to crack on with knitting the elephant. You are allowed to take knitting needles on certain flights: check the rules for hand luggage on your airline and at the departure and arrival airports. You’re also allowed to take scissors if the blade is below a certain length. If in doubt email ahead and print off confirmation. I wasn’t challenged fortunately. I had a bit of a break from the elephant whilst working on some other projects and came back to it in November. I managed to give the finished item to Beatrice just 6 days before she gave birth when she just looked fabulous. Looking forward to meeting baby soon. The next challenge was a parrot. Tim’s parents were going to a pirate party and I reckoned an outfit would be much better with a knitted parrot. 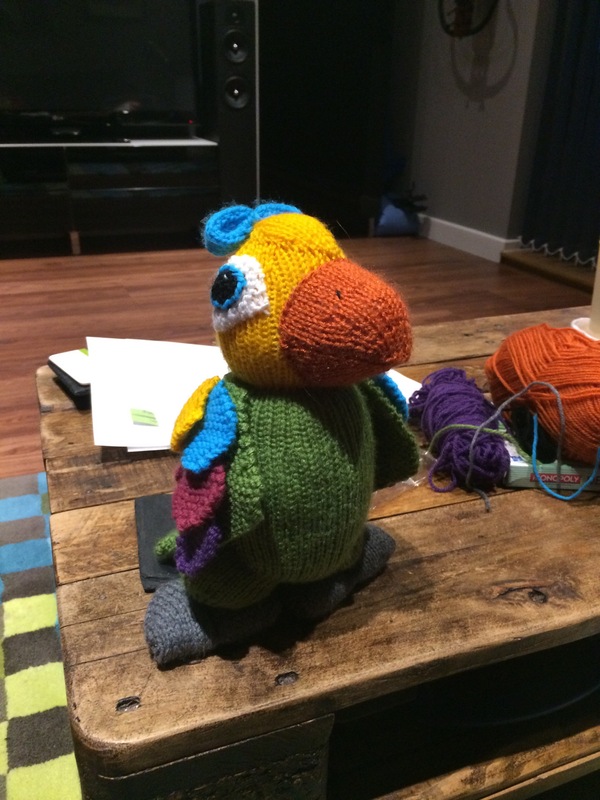 I had just three weeks to make the parrot and completed it in 2 1/2 weeks. I could have done it quicker but had been out a few nights and weekends. The parrot was not from the book, but found on Pinterest. You can find the pattern here from the letsknit website (you have to register but the pattern is free). I changed the colours around to suit what I had (as I was using up remnants). Once again the end result was awesome and I was really pleased! Siona, sorry I missed you last night. People kept ringing off. I hear you had a lovely time. See you on on the 22 March if not before. Love Pam.